in control circuits and low power circuits. releasing can be done stably with a light force. retainer installed in the housing. Connection is disengaged by releasing the locking arm provided in the housing. Simplified locking mechanism allows quick disconnection without release operation. This is a horizontal type connector,installed to Printed Circuit Boards in horizontal direction,and is used for connection of cable with P.C.board.38-pin is a split type using two pieces on F side. 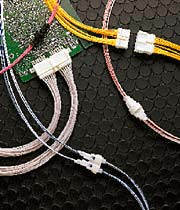 This is a vertical type connector,installed to Printed Circuit Boards in vertical direction,and is used for connection of cable with P.C.board.